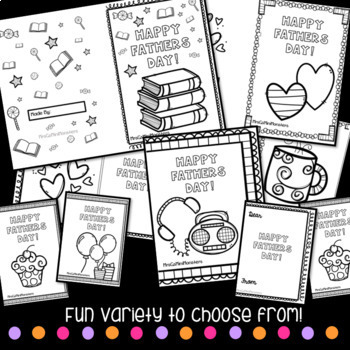 6 different sets of adorable Fathers Day card templates with pictures to color in and templates to write, super cute and ready to print and decorate! Front page, back page, inside picture page and inside writing page all included! 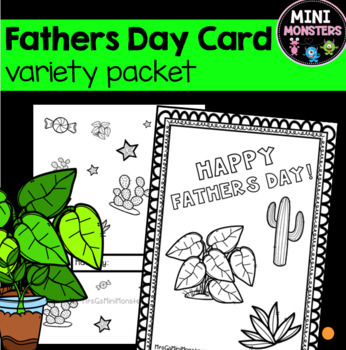 There is a bonus card included that says 'Happy Grandfathers Day' for those students who may need a different option. These cards are not limited to who they could be for -step-parents, brothers, uncles, grandparents. The first six all say 'Happy Fathers Day' on the front, but on the inside have 'Dear ……..' with a blank space for the student to write any special persons name. Adorable, no prep and several designs to choose from. Don't forget to follow my store for flash freebies and sale alerts, and leave feedback for TPT credits to be redeemed for discounts on future purchases!